Over 40 MCAST students have worked tirelessly for the past three months to deliver the Christmas 3D Architectural Mapping Projection on The Palace facade. The collaboration between Valletta 2018 and MCAST goes back almost two years and the 3D Architectural Mapping Projection Show, along with other projects, serve as live case studies for students while helping them gain experience to deliver work on a professional level. 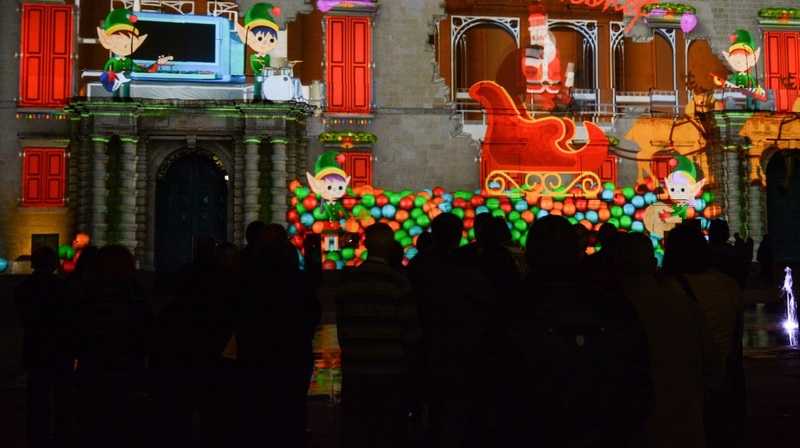 President Marie Louise Coleiro Preca together with Valletta 2018 Chairman Jason Micallef and the President of the MCAST Board of Governors, Silvio De Bono, gave their best wishes for Christmas and the New Year while launching the 3D Architectural Mapping Projection show on The Palace façade. The story takes us to Santa Claus’ workshop where his seven elves process all the letters and make all the toys. This is also the place where one science experiment goes terribly wrong. On Christmas Eve, Clara the Elf produces her latest chemicals which react violently in an experiment causing an explosion. Amid the mess, all the toys come to life! The turn of events is both baffling and exciting. The collaboration with MCAST goes back almost two years and the 3D Architectural Mapping Projection Show, along with other projects, serve as live case studies for students while helping them gain experience to deliver work on a professional level. The show transforms The Palace façade at St George’s Square every 30 minutes, between 5.30pm and 10.30pm from the 23rd December until New Year’s Eve. An extra show takes place after the midnight mass on Christmas Eve.